The NCAA Division I Women’s Volleyball committee announced Sunday on ESPNU the 64-team field that will compete in the 2016 NCAA Division I Women’s Volleyball Championship hosted in Columbus at Nationwide Arena on December 15 and 17. Thirty-two conferences were awarded an automatic qualification, while the remaining 32 positions were filled with at-large selections to complete the bracket. The top 16 teams were seeded nationally and placed within four regions. Members of the media can purchase tickets to the NCAA Division I Women’s Volleyball Championship at www.NCAA.com/Volleyball, at the Nationwide Arena box office or by calling 800-745-3000. Columbus is in the running to set the all-time attendance record for the Championship with limited lower bowl seating remaining. A limited number of rooms are available at the Hilton Columbus Downtown (401 North High Street, Columbus Ohio, 43215). The rate is $139/night plus tax. Please email Sahar Abdur-Rashid with the NCAA for information on how to be included in the media block. The 2016 NCAA Division I Women’s Volleyball Championship, one of the NCAA’s marquee championship events, is headed to the Buckeye State for only the second time in the tournament history. The event was held in Cleveland 20 years ago in 1996. Nationwide Arena with a capacity of 18,103 will be the largest venue to host this NCAA championship event. Current ticket sales give Columbus a chance at setting the all-time attendance mark. Columbus is also making NCAA history in becoming the first city to host both the women’s and men’s NCAA Volleyball Championships in the same academic year. 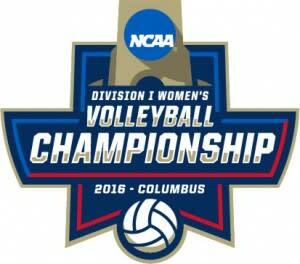 Ohio State will host the National Collegiate Men’s Volleyball Championship at St. John Arena May 4-6. Ohio State Athletics and the Greater Columbus Sports Commission has submitted a bid for the 2021 NCAA Division I Women’s Volleyball Championships and will learn if the city is a finalist in early 2017. The NCAA Division I Women’s Volleyball Championship will generate an estimated 10 million dollars in direct visitor spending for Central Ohio from attracting more than 36,000 fans to Nationwide Arena over two nights, with all three matches (semifinals and final rounds) nationally broadcast on ESPN2. The American Volleyball Coaches Association (AVCA) Annual Convention, attended by 2,500 coaches, and the AVCA UnderArmour All-American match for high-school girls, which will also be nationally broadcast on CBSSports, will be held in conjunction with the event, along with other NCAA ancillary activities. The convention will represent close to 5,000 total room nights alone and utilize more than 90,000 square feet at the Greater Columbus Convention Center for their meetings.